Video released by police shows how a woman cuffed and stuffed in the back of a police car was able to slip out of her restraints, crawl into the front seat and lead law enforcement officers on a 100mph chase for more than 20 minutes. The Lufkin Police Department in Texas released footage Tuesday that shows officers restraining Toscha Sponsler, 33, after receiving a call of a possible shoplifter at an Ulta Beauty Salon. While police searched her bag, Sponsler, who was restrained in the back of a patrol car, kept an eye out for the officers. When no one was looking, she wriggled out of her seat belt, slipped out of her cuffs and climbed through a 12-inch window partition to the driver’s seat. In a Facebook post, the police said that the partition was left open in order to allow Sponsler to “receive more air conditioning in the back seat and also speak with her through the course of the investigation.” They added that the partition is never left open while transporting suspects. The video shows Sponsler driving away as officers attempted to chase the vehicle on foot before jumping into their patrol cars to pursue her. Sponsler is then seen speeding through residential areas, swerving around other police cruisers. At one point, she drives off the road to avoid a spike trap laid down by an officer. “Sponsler led units down Loop 287 to 69 south, nearly colliding head-on with two Lufkin officers, Constable Chad Wilson and numerous motorists,” Lufkin Police Department Media Specialist Pebsworth stated in a press release obtained by the Lufkin Daily News. Sponsler then led police on a high-speed pursuit for 23 minutes, reaching speeds of 100 miles per hour, according to the police. 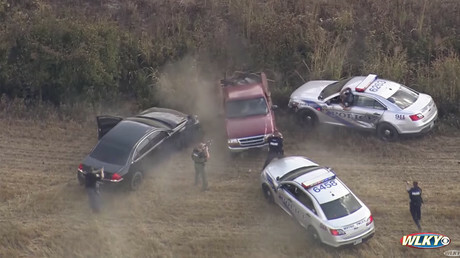 The pursuit finally ended after a Department of Public Safety officer used a PIT maneuver that caused Sponsler to lose control of the vehicle. Sponsler waived medical treatment at the scene and was taken to the Angelina County Jail, where she remains on a collective bond of $18,000. She has been charged with escape causing serious bodily injury/threat of a deadly weapon, aggravated assault against a public servant, possession of a controlled substance, evading arrest with a vehicle with a previous conviction and unauthorized use of a vehicle. Police say additional charges are still pending. The deadly weapon charge stems from officers who claim Sponsler was reaching for a shotgun that was mechanically locked to the vehicle. Lufkin Police Department Assistant Chief David Thomas said an internal review of the incident is being conducted. The video ends with a Lufkin officer drilling a “tactical window limitation device” in the window partition to prevent a similar event from occurring in the future.The police said that the department has installed the device in all marked units to reinforce the partition and keep it from opening more than four inches.